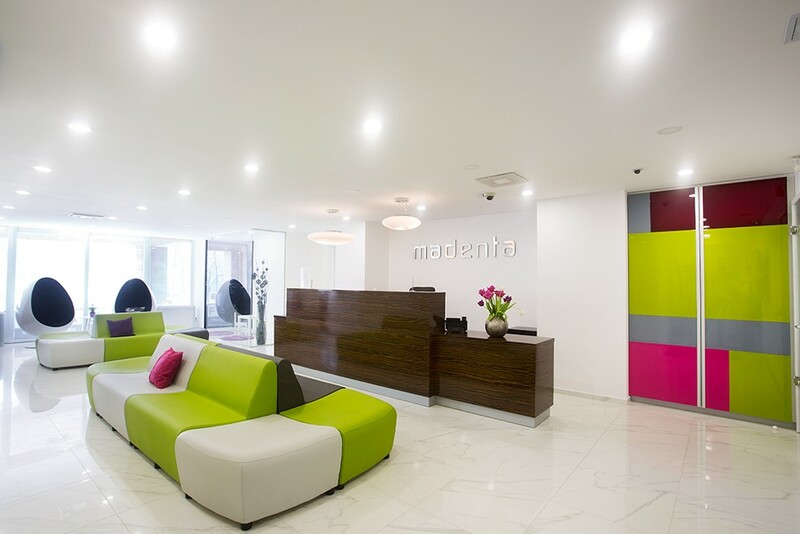 Welcome to Madenta Dental Clinic! Our clinic offers a full spectrum of treatments, exceptionally high-quality of care, the latest technology, the highest medical standards, affordable prices, a central location, where you’ll find an exclusive and professional environment, and much more. Improve your dental health while on holiday? Save up to 70% on dental costs and discover Budapest during the same trip – we help you make the most of your “dental holiday”. Explore Budapest between your dental sessions and go home with a healthy smile. 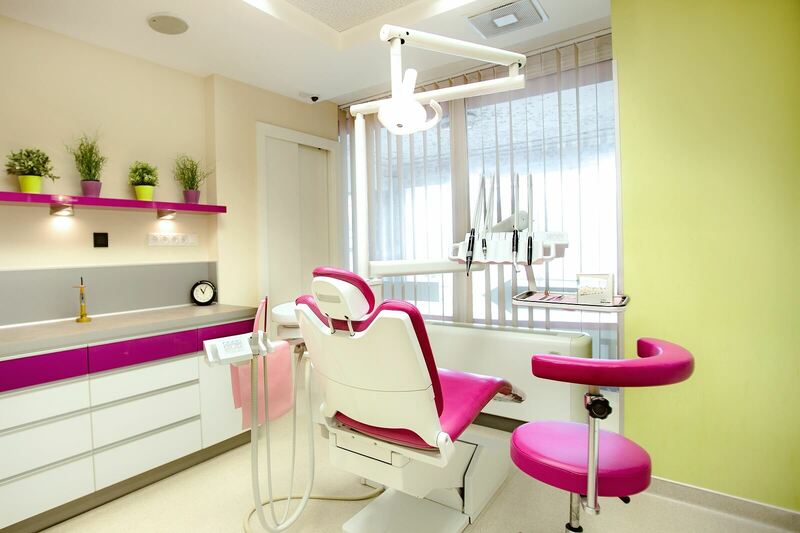 With its magnificent architecture and gorgeous setting along the Danube river, Hungary’s capital is also the best destination for those who are seeking out outstanding dentistry at optimal prices. 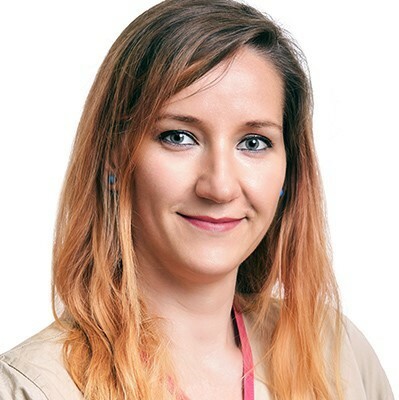 The industry’s ability to provide this to you is no mystery: Hungarian medical and dental universities are known throughout Europe for the high level of scientific research and education. 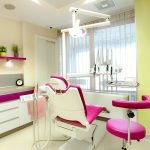 Well-educated Hungarian dental specialists in Budapest can provide you with the latest treatment options in a comfortable atmosphere. We understand that it can be difficult to decide on complex dental services in a remote country and that many questions may arise. How long will the treatment take? How often do I have to go to Budapest? Is the dentist good and is he/she trustworthy? 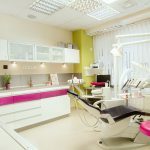 How can I make sure that no unexpected costs arise, or avoid any other surprises regarding my dental treatment abroad? 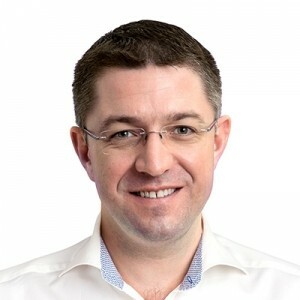 For those who travel to Budapest for their dental treatment, we provide some extra services in order to ensure that the treatment goes as smoothly as possible. 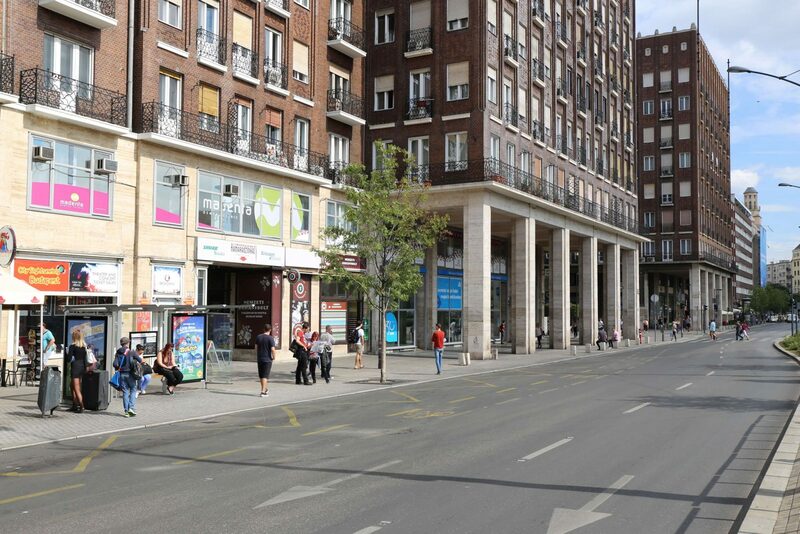 In contrast to locals, you are only in Hungary for a limited amount of time, so your stay will therefore require increased flexibility from our side regarding your appointments, the frequency of dental procedures needed, swift manufacture of prosthetics, etc. In many cases, we must make sure that our foreign guests get same-day appointments in order to finish the treatment as planned. We pay extra special attention to helping foreign patients find their way around, both in their dental treatment and stay in Budapest. 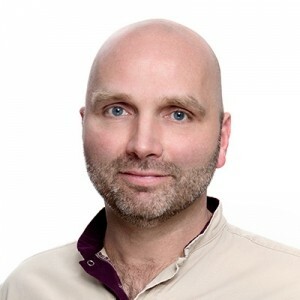 Our English-, Danish- and French-speaking coordinators will guide you through the entire process, from first contact through the booking of flight and accommodation through to the end of your treatment. 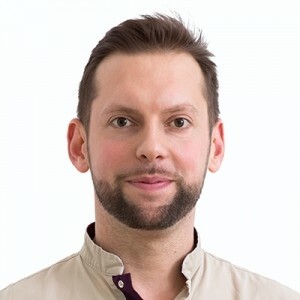 They are there through the duration of your stay and can answer any questions you may have, either about your treatment or anything having to do with your stay in Budapest. Our state-of-the-art technology, materials and clinical facilities aid that your treatment will be carried out as fast as possible but never at the expense of quality. 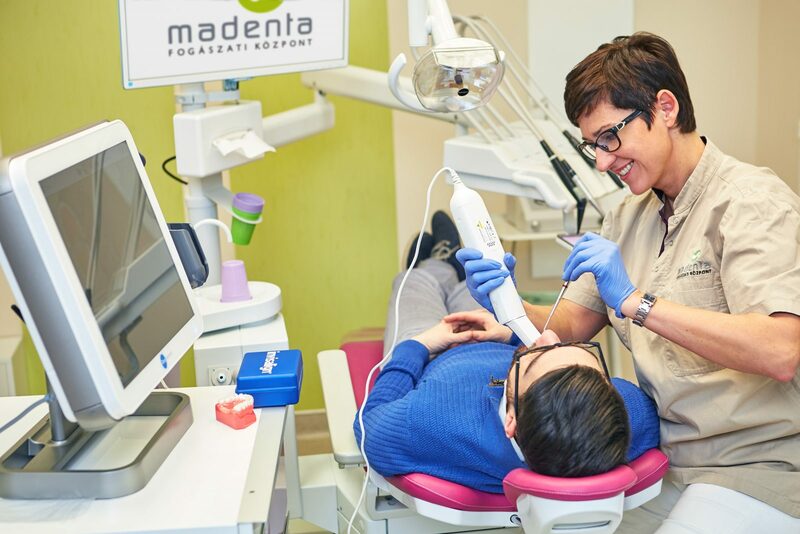 Among others, our in-house CT and X-ray, intraoral scanner, digital smile design, and the latest, super quick All-on-4 technology are all contributors to making for an effective dental stay, and will leave you with a perfect and happy smile! Missing teeth can result in aesthetic, social, psychological and health consequences, or you may even face difficulties eating or with pronunciation. This is why it is crucial to replace any missing teeth as soon as possible. If you’d like to “bridge the gap”, in your smile, implantation offers the most up-to-date method for an aesthetic prosthesis. 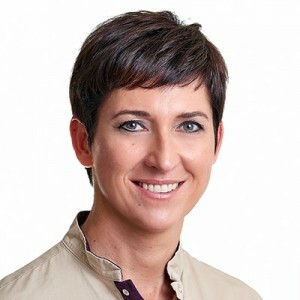 It is no surprise that this operation has become popular, since it is a long-term solution to missing teeth. In order to make a proper diagnosis of your individual dental state or condition, we utilize different types of dental imaging diagnostics. For a more accurate evaluation of a dental lesion, or to measure overall bone quantity for a successful implantation procedure, we perform a 3D diagnostic CT scan. Based on these, our specialists can devise an individual treatment plan for you. The innovative ALL-on-4® technology is an immediate solution, even for those without any teeth at all. Using this technique, up to four implants can be used to secure the complete upper or lower dentures. Following implantation, our oral surgeon immediately applies a temporary denture, so that within 24 hours you receive an aesthetically and functionally perfect denture. The procedure is shorter, healing is faster, and the entire treatment is more cost effective. Our Clinic offers long-lasting, aesthetically flawless removable and fixed denture solutions (if implantation is not an option). While implants are the most optimal approach for replacing teeth, these days other innovative technologies also satisfy patients’ multiple needs. We provide all of the innovative teeth replacement methods available on the market. 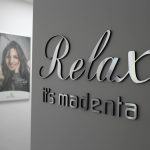 If you’re the kind of person who is afraid of going to the dentist, dislike the sound of dental drills, or are worried about potential discomfort from your dental procedure, use of a general anesthesia might be the right solution for you at Madenta. Or maybe you have a medical condition for which an anesthetic is an absolute must during dental treatment. Patients over 50 need to submit some lab tests and receive a consultation with our anesthesiologist before any anesthesia is administered. Have your teeth become so discoloured that whitening treatments just wouldn’t be effective? Have you got gaps between your teeth? Are you longing for a Hollywood smile, but your teeth are not fit for the silver screen? Veneers could fit the bill, providing an effective solution to such complaints! These extremely thin porcelain facings are used specifically for the visual correction of the form, color or address small misalignments of the teeth. They are a gentle solution that provide tangible aesthetic improvements in a short time and give a natural look to your smile. White teeth have always been a common dream. But only a few of us receive such a dreamlike smile from nature. If you are not among them, we can help and make your teeth look 6-7 shades whiter, using mild and gentle techniques. We provide both “clinical whitening” and “at-home whitening”, to get that shiny smile you have always dreamed about! Dental crowns are used to fill gaps and to complete your smile if any of your teeth have been damaged or are missing. We use dental crowns for a variety of reasons such as when a tooth has been significantly damaged, an old crown needs to be replaced, or to address a tooth’s irregularity or undesirable shape. As part of an implantation procedure, crowns are also used to cover dental implants. Orderly teeth are not just an aesthetic issue: orthodontics is an essential tool for maintenance and retention of our teeth. And now people of all ages can reap the advantages of this type of treatment! Since our innovative orthodontic instruments are not only comfortable and effective, many are also imperceptible. This means through our orthodontic solutions we can achieve a very noticeable change affecting all aspects of the patient's life. If a tooth is damaged by decay, we can render it back to its normal function and shape by applying a filling. First of all, your dentist will remove the decay and clean it. Various types of material can be used for the filling he/she will then apply to your tooth, ensuring that it matches the color of the enamel of your teeth and their shape, so no one will know you’ve had a tooth filled or be able to know the difference between that spot and your actual teeth. Can you see those yellow-brownish deposits between the teeth and gums? That is tartar. Do your teeth have brown spots? These are microbial deposits, which are a combination of food, pigment and hardened saliva. They cannot be removed with your everyday toothbrush and unfortunately these deposits cause gum disease. This is a great environment for bacteria. We recommend that our patients get oral hygiene treatment at least twice a year, which can be a part of their regular dental checkup. * Please note that we only accept payment in EUR or our local currency, HUF. The All-on-4® procedure is the very best technology implantology can offer today. Via this innovative solution, only four implants are needed to hold a full upper or lower denture firmly in place. The dental surgeon immediately installs a temporary replacement on the implants, so in 24 hours patients can go from no teeth to aesthetically and functionally perfect dentures. Due to this special technology, All-on-4® does not require bone grafting surgery, even when there is insufficient bone volume. This procedure is shorter, healing time is faster, and the whole treatment is more cost effective. 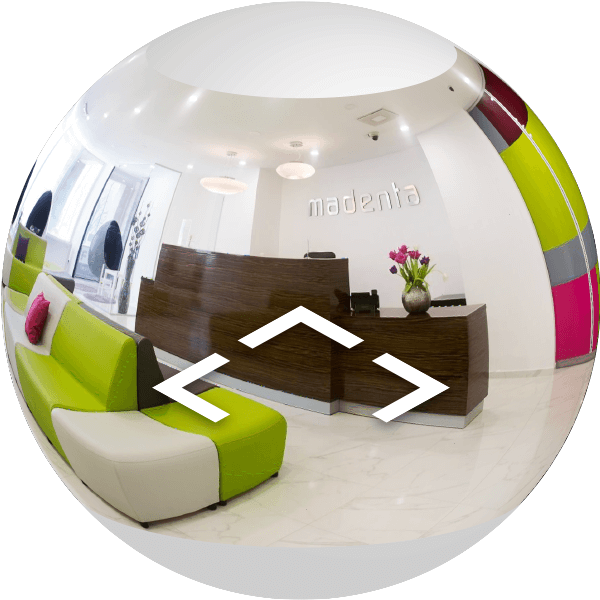 Take a look at our video and see how it works at Madenta! After an evaluation of your X-rays or CT scan and an oral examination, our highly-qualified specialist will devise an individual treatment plan for you. They will go through any emerging issues and all the possible treatment options with you, the patient. In order to devise a more exact treatment plan and to diagnose any possible problems, we highly recommend having an X-ray taken of your oral cavity (this could be a digital panoramic X-ray, periapical X-ray, or cephalometric X-ray). During your free, initial consultation you can discuss the details of treatment with your doctor and ask questions if you have any. Your offer from us will include a detailed treatment plan based on the consultation and 3D scanning results. When you arrive to Budapest Airport, our driver will be waiting for you holding up a board with your name on it in the arrivals section of the terminal. From there, we provide you free transfer to our dental clinic or to your apartment or hotel. 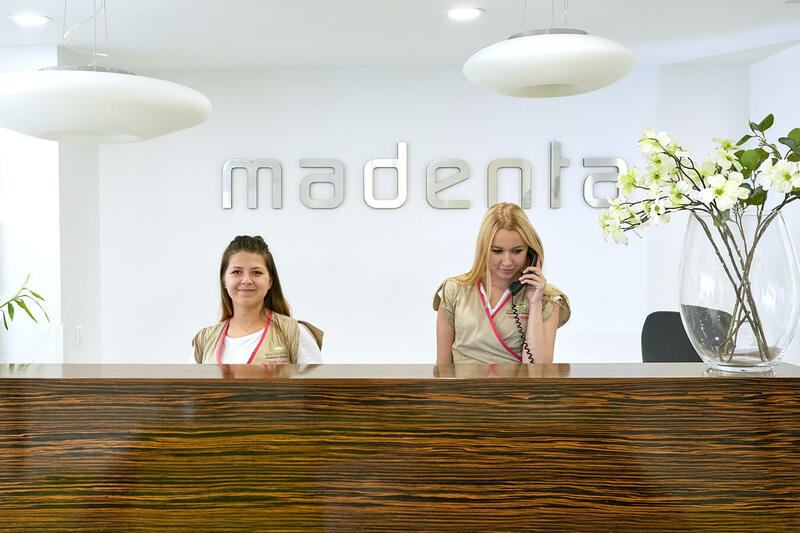 At Madenta, 15 experienced dentists, highly qualified specialists without exception, work to ensure that you receive dental services of the highest quality. Our dentists are specialized in all fields of dentistry, including dental aesthetics, implantology, surgery, prosthetics and pediatric dentistry. 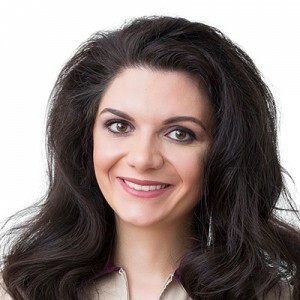 Due to our vast experience, strict training requirements and strong quality assurance system, we can provide you with the most up-to-date dental and surgical procedures in beautiful Budapest. No matter how complex your requirements are, you will be in good hands! 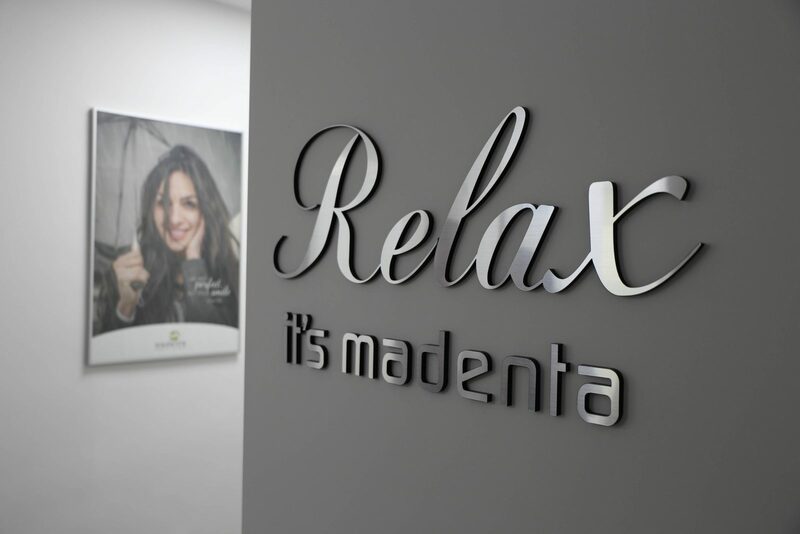 Madenta Dental Clinic was established in 2000 with the aim of providing a full range of dental treatments of the highest standard. 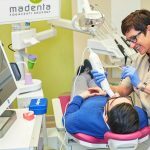 Due to our outstanding proficiency and the most up-to-date technology, in the last 18 years Madenta has grown to be one of Hungary’s leading dental clinics. Let the numbers speak for themselves: to date, we have treated over 75,000 local and international patients! All dental services offered in one facility. We work to provide you with clear information about prices and services. Your Madenta invoice will not conceal any hidden or unexpected costs! Our dental health packages include a service team offering free advice, a free Panoramic X-Ray, free treatment plan, and free airport transfers. 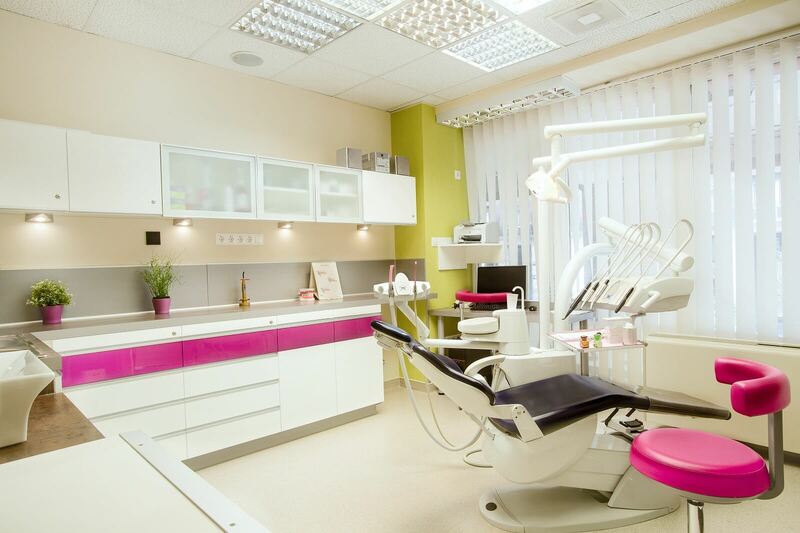 Our clinic is well equipped with the latest available instrumentation, including: KAVO dental equipment, CB-CT scanner, 3Shape TRIOS® intraoral scanner, 3D printed prosthetic work, Nobel Biocare and Alpha Bio implant systems, among others. Whether in summer or winter, Budapest has a lot to offer: thermal baths or boat trips on the Danube, concerts or quiet coffee houses, shop, stroll or sightsee - everyone will find something to their liking. You can also enjoy Hungarian cuisine - at the latest after completing your dental treatment! New teeth will lead to new experiences. An important symbol of Hungarian Judaism, this Moorish style building, which was built in 1859, is Europe's largest and the second largest synagogue in the world; its size reflects the importance of contemporary Jewry in Budapest. The stunning temple is still a place of worship today, but it also hosts cultural programs and concerts. It can be visited all year long, but is closed on Saturdays and Jewish holidays. All admission tickets include multilingual guided tours. Address: Budapest, VII. district, Dohány street 2. Its centuries-old, rich musical life elevated Hungary’s prominence as a centre for ecclesiastical music. The neo-Gothic church, decorated with colourful Zsolnay tiles on its roof, was built from snow-white limestone. Its exotic interior makes for a dignified setting for both worship and music events, like the regular, free organ concerts there on Sundays. 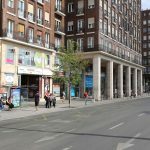 Address: Budapest, Szentháromság tér 2. This is the oldest, most famous bridge on the Danube, connecting Buda and Pest. The eye-catching, glamorous, unforgettable sight of the structure is a symbol of the Hungarian capital. The bridge is often closed to vehicle traffic in the summer months on weekends and for certain celebrations to allow pedestrians and picnics free reign. Starting in 1934, Budapest has been called “Badestadt.” This is no wonder, because the city sits on the most thermal and medicinal waters in the world. Today, 15 healing spas are available for healing, bathing and relaxation in Budapest. The Széchenyi is Europe's largest spa complex. Its medicinal water flows from the capital’s second deepest well, which is 1246 meters deep, to the surface. Today, the facility now has 21 water basins and 10 saunas. The water, which emanates from the heart of Városliget park, is recommended for joint and spine ailments, arthritis, orthopedic surgeries and post-accident rehabilitation, nerve pain, and osteoporosis. While relaxation is almost guaranteed, the facility’s mainly neo-Renaissance elements also offer an unforgettable aesthetic experience. The Széchenyi is open all year round. Address: Budapest, XIV. district Állatkerti körút 9-11. Margit Sziget is an island on the Danube river set between the two halves of Budapest. Apart from some hotels, catering and sport facilities, and a water tower built in 1911, there are no buildings there - it is one of the capital’s huge parks, with medieval sacral architectural monuments, sculpture estates, a petting zoo, ponds, a running trail and diverse flora and fauna. On the south-eastern portion there is a fountain with a diameter of 36 meters whose central water jet shoots more than 25 meters in height, in summer. Containing Hungary's oldest and largest collection of zoological gardens, this facility at the heart of Városliget is a nature reserve. Today, it is one of the most visited cultural public institutions in Hungary, with more than 1 million visitors annually. One of the specialties of the zoo is its turn-of-the-century architectural atmosphere. Its buildings and structures received historically protected status in 2009. Within the zoo there are several remarkable works of art: some decorative elements of the buildings, others free-standing creations. Address: Budapest, XIV. District, Városliget, Állatkerti körút 6-12. At the Pest side of Liberty Bridge sits the largest covered market in Budapest. This structure, whose roof is covered in Zsolnay tiles, opened in 1897, a time when boats brought in fresh goods on a channel running through it. Today there is no floating market, but there are fresh vegetables, fruit, quality meat, salami and other domestic products. The mezzanine features a row of buffets offering delectable (sometimes overpriced) Hungarian foods: traditional fried dough (“lángos”), goulash soup, stuffed cabbage and Hortobágy crepes. Not only are the food specialities captivating, but the spectacular architecture in the market hall is also impressive. Address: Budapest, IX. district, Vámház körút 1-3. Running from Deak tér to Heroes' Square, Andrássy út stretches over 2 kilometers, wowing you with its elegant shops, imposing trees and beautiful buildings, like the Opera House, the House of Terror Museum and the most spacious and impressive square of Budapest, the grandiose Heroes' Square, which together with the avenue is part of a World Heritage Site. The Onyx boasts two stars, while the other three hold just one star a piece. The recognition is not without foundation: all four restaurants await enthusiasts of high gastronomy with masterly crafted culinary delights, unparalleled selections of wine and accommodating service. Take your first step towards the perfect smile by submitting a call-back request! We will call you back within 24 hours!